Charlotte very capably opened the show and appeared to be really enjoying herself as she did so. There was a lot to like about the set, and if she can hold on to the kind of bravery shown in playing song ‘Marathons’, written only 24 hours earlier, then I’m sure we will be seeing Charlotte’s name popping up on gig listings for years to come. There isn’t long to wait before Cornelius Crane make it to the stage. Early on in the set their sound reminds me of mid-90s Britpop, not least on song ‘Rooster’, though given I grew up listening to that style of music it can only be considered a good thing in my book. The Americana influences that Cornelius Crane claim for themselves are clearly present later in the set when one of the two conventional guitars makes way to be replaced by a pedal steel guitar, and that is surely enough to mean this band will get real far. Once the stage has again been vacated I head off to the bar, only to find that our headline act is hanging out there herself. Ten minutes before being due onto stage she disappears, as does the majority of the equipment on the stage. 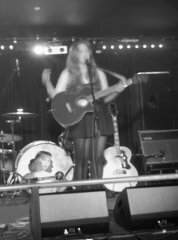 Samantha arrives with just her acoustic guitar and nobody to keep her company, but that doesn’t stop her commanding the audience’s attention immediately as she opens with ‘Santa Fe’. The stage presence for someone with such a small stature is remarkable. The songs are entrancing and everyone in attendance is whisper quiet throughout and seems genuinely engaged as she introduces almost every track with a story. Blaming her talkative nature on the lack of a band to talk to during the day, I find myself as much looking forward to what she has to say to introduce each song as the song itself. Examples include the story of ‘Never Going Back’, which is not, as one magazine printed, inspired by the Taylor Swift song ‘Never Getting Back Together’ and her tale about ‘Devils in Boston’, which is actually a song about New York City, but New York City just has too many syllables. Having freely admitted she hasn’t prepared a setlist, someone calls for the song ‘Lions’, not only is it immediately played, Samantha thanks them for helping out. When appearing for an encore, she confesses to being unsettled by the metal bar separating the stage from the crowd, so heads down from the stage to play her final song ‘Songs In The Night’ in amongst her fans and completely unplugged. Given I had come hoping to hear songs from ‘Kid Face’, which features a number of instruments, I had been initially wary when I realised the show would be performed without a band. I’m happy to say my concerns were unfounded, the charm of the solo performance was far greater than I could have expected. 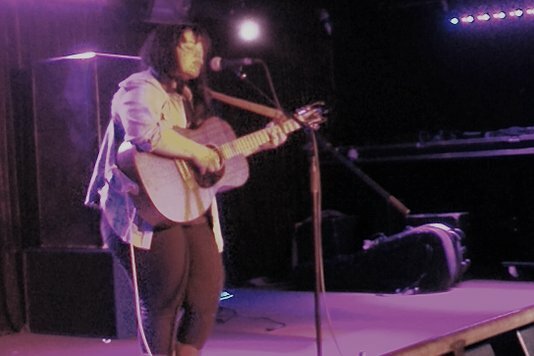 Samantha Crain is clearly a talented performer in addition to being an excellent song writer and I hope I will get a chance to see her again soon.